A tax haven is defined as a country or place with very low "effective" rates of taxation for foreign investors ("headline" rates may be higher[a]). In some traditional definitions, a tax haven also offers financial secrecy. [b] However, while countries with high levels of secrecy but also high rates of taxation (e.g. the United States and Germany in the Financial Secrecy Index ("FSI") rankings),[c] can feature in some tax haven lists, they are not universally considered as tax havens. In contrast, countries with lower levels of secrecy but also low "effective" rates of taxation (e.g. Ireland in the FSI rankings), appear in most § Tax haven lists. The consensus around effective tax rates has led academics to note that the term "tax haven" and "offshore financial centre" are almost synonymous. Traditional tax havens, like Jersey, are open about zero rates of taxation, but as a consequence have limited bilateral tax treaties. Modern corporate tax havens have non-zero "headline" rates of taxation and high levels of OECD–compliance, and thus have large networks of bilateral tax treaties. However, their base erosion and profit shifting ("BEPS") tools enable corporates to achieve "effective" tax rates closer to zero, not just in the haven but in all countries with which the haven has tax treaties; putting them on tax haven lists. According to modern studies, the § Top 10 tax havens include corporate-focused havens like the Netherlands, Singapore, Ireland and the U.K., while Luxembourg, Hong Kong, the Caribbean (the Caymans, Bermuda, and the British Virgin Islands) and Switzerland feature as both major traditional tax havens and major corporate tax havens. Corporate tax havens often serve as "conduits" to traditional tax havens. Use of tax havens results in a loss of tax revenues to countries which are not tax havens. Estimates of the § Financial scale of taxes avoided vary, but the most credible have a range of US$100–250 billion per annum. In addition, capital held in tax havens can permanently leave the tax base (base erosion). Estimates of capital held in tax havens also vary: the most credible estimates are between US$7–10 trillion (up to 10% of global assets). The harm of traditional and corporate tax havens has been particularly noted in developing nations, where the tax revenues are needed to build infrastructure. Over 15%[d] of countries are sometimes labelled tax havens. Tax havens are mostly successful and well-governed economies, and being a haven has brought prosperity. The top 10–15 GDP-per-capita countries, excluding oil and gas exporters, are tax havens. Because of § Inflated GDP-per-capita (due to accounting BEPS flows), havens are prone to over-leverage (international capital misprice the artificial debt-to-GDP). This can lead to severe credit cycles and/or property/banking crises when international capital flows are repriced. Ireland's Celtic Tiger, and the subsequent financial crisis in 2009–13, is an example. Jersey is another. Research shows § U.S. as the largest beneficiary, and use of tax havens by U.S corporates maximised long-term U.S. exchequer receipts. The focus on combating tax havens (e.g. OECD–IMF projects) has been on common standards, transparency and data sharing. The rise of OECD-compliant corporate tax havens, whose BEPS tools are responsible for most of the lost taxes, has led to criticism of this approach, versus actual taxes paid. Higher-tax jurisdictions, such as the United States and many member states of the European Union, departed from the OECD BEPS Project in 2017–18, to introduce anti-BEPS tax regimes, targeted raising net taxes paid by corporations in corporate tax havens (e.g. the U.S. Tax Cuts and Jobs Act of 2017 ("TCJA") GILTI–BEAT–FDII tax regimes and move to a hybrid "territorial" tax system, and proposed EU Digital Services Tax regime, and EU Common Consolidated Corporate Tax Base). There is no established consensus regarding a specific definition for what constitutes a tax haven. This is the conclusion from non-governmental organisations, such as the Tax Justice Network in 2018, from the 2008 investigation by the U.S. Government Accountability Office, from the 2015 investigation by the U.S. Congressional Research Service, from the 2017 investigation by the European Parliament, and from leading academic researchers of tax havens. The issue, however, is material, as being labelled a "tax haven" has consequences for a country seeking to develop and trade under bilateral tax treaties. When Ireland was "blacklisted" by G20 member Brazil in 2016, bilateral trade declined. It is even more onerous for corporate tax havens, whose foreign multinationals rely on the haven's extensive network of bilateral tax treaties, through which the foreign multinationals execute BEPS transactions, re-routing global untaxed income to the haven. One of the first § Important papers on tax havens, was the 1994 Hines–Rice paper by James R. Hines Jr. It is the most cited paper on tax haven research, even in late 2017, and Hines is the most cited author on tax haven research. As well as offering insights into tax havens, it took the view that the diversity of countries that become tax havens was so great that detailed definitions were inappropriate. Hines merely noted that tax havens were: a group of countries with unusually low tax rates. Hines reaffirmed this approach in a 2009 paper with Dhammika Dharmapala. In December 2008, Dharmapala wrote that the OECD process had removed much of the need to include "bank secrecy" in any definition of a tax haven and that it was now "first and foremost, low or zero corporate tax rates", and this has become the general "financial dictionary" definition of a tax haven. Hines refined his definition in 2016 to incorporate research on § Incentives for tax havens on governance, which is broadly accepted in the academic lexicon. Tax havens are typically small, well-governed states that impose low or zero tax rates on foreign investors. In April 1998, the OECD produced a definition of a tax haven, as meeting "three of four" criteria. It was produced as part of their "Harmful Tax Competition: An Emerging Global Issue" initiative. By 2000, when the OECD published their first list of tax havens, it included no OECD member countries as they were now all considered to have engaged in the OECD's new Global Forum on Transparency and Exchange of Information for Tax Purposes, and therefore would not meet Criteria ii and Criteria iii. Because the OECD has never listed any of its 35 members as tax havens, Ireland, Luxembourg, the Netherlands and Switzerland are sometimes defined as the "OECD tax havens". In 2017, only Trinidad & Tobago met the 1998 OECD definition, and it has fallen into disrepute. (†) The 4th criterion was withdrawn after objections from the new U.S. Bush Administration in 2001, and in the OECD's 2002 report the definition became "two of three criteria". The 1998 OECD definition is most frequently invoked by the "OECD tax havens". However, it has been discounted by tax haven academics, including the 2015 U.S. Congressional Research Service investigation into tax havens, as being restrictive, and enabling Hines’ low-tax havens (e.g. to which the first criterion applies), to avoid the OECD definition by improving OECD corporation (so the second and third criteria do not apply). In April 2000, the Financial Stability Forum (or FSF) defined the related concept of an offshore financial centre (or OFC), which the IMF adopted in June 2000. An OFC is similar to a "tax haven" and the terms are sometimes used interchangeably, but the term OFC is less controversial and pejorative. The FSF–IMF definition focused on the BEPS tools havens offer, and on Hines' observation that the accounting flows from BEPS tools distort the economic statistics of the haven. The FSF–IMF list captured new corporate tax havens, such as the Netherlands, which Hines considered too small in 1994. In October 2010, Hines published a list of 52 tax havens, which he had scaled quantitatively by analysing corporate investment flows. Hines' largest havens were dominated by corporate tax havens, who Dharmapala noted in 2014 accounted for the bulk of global tax haven activity from BEPS tools. The Hines 2010 list was the first to estimate the ten largest global tax havens, only two of which, Jersey and the British Virgin Isles, were on the OECD's 2000 list. 5 Conduit OFCs: jurisdictions through which a disproportionate amount of value moves toward sink OFCs (e.g. the modern corporate tax havens). 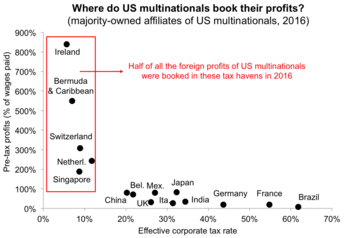 In June 2018, tax academic Gabriel Zucman (et alia) published research that also ignored any definition of a tax haven, but estimated the corporate "profit shifting" (i.e. BEPS), and "enhanced corporate profitability" that Hines and Dharmapala had noted. Zucman pointed out that the CORPNET research under-represented havens associated with US technology firms, like Ireland and the Cayman Islands, as Google, Facebook and Apple do not appear on Orbis. Even so, Zucman's 2018 list of top 10 havens also matched 9 of the top 10 havens in Hines' 2010 list, but with Ireland as the largest global haven. These lists (Hines 2010, CORPNET 2017 and Zucman 2018), and others, which followed a purely quantitive approach, showed a firm consensus around the largest corporate tax havens. In October 2009, the Tax Justice Network introduced the Financial Secrecy Index ("FSI") and the term "secrecy jurisdiction", to highlight issues in regard to OECD-compliant countries who have high tax rates and do not appear on academic lists of tax havens, but have transparency issues. The FSI does not assess tax rates or BEPS flows in its calculation; but it is often misinterpreted as a tax haven definition in the financial media,[c] particularly when it lists the US and Germany as major "secrecy jurisdictions". However, many types of tax havens also rank as secrecy jurisdictions. Governmental, Qualitative: these lists are qualitative and political; they never list members (or each other), and are largely disregarded by academic research; the OECD had one country on its 2017 list, Trinidad & Tobago; the EU had 17 countries on its 2017 list, none of which were OECD or EU countries, or § Top 10 tax havens. Tax rate – focus on effective tax rates, like the Hines–Rice 1994 list, and the Dharmapala–Hines 2009 list. (Hines and Dharmapala avoided rankings in these lists). Connections – focus on legal connections, either Orbis connections like CORPNET's 2017 Conduit and Sink OFCs, or subsidiary connections like the ITEP Connections 2017 list. GDP-per-capita tables – Another effective "sense–check" of a tax haven is distortion in its GDP/GNP from the IP–based BEPS tools and Debt–based BEPS tools. Excluding the non-oil & gas nations (e.g. Qatar, Norway), and micro jurisdictions, the resulting highest GDP-per-capita countries are tax havens, led by: Luxembourg (#1), Singapore (#2), and Ireland (#3). The post–2010 rise in quantitative techniques of identifying tax havens has resulted in relatively consistent identification of the ten largest tax havens. Dharmapala notes that as corporate BEPS flows dominate tax haven activity, these are mostly corporate tax havens. Nine of the top ten tax havens in Gabriel Zucman's June 2018 study appear in the top ten lists of the two other quantitative studies since 2010. Four of the top five Conduit OFCs are represented; however, the United Kingdom only transformed its tax code in 2009–2012. All five of the top 5 Sink OFCs are represented, although Jersey only appears in the Hines 2010 list. The studies capture the rise of Ireland and Singapore, both major regional headquarters for some of the largest BEPS tool users, Apple, Google and Facebook. In Q1 2015, Apple completed the largest BEPS action in history, when it shifted US$300 billion of IP to Ireland, which Nobel-prize economist Paul Krugman called "leprechaun economics". In September 2018, using TCJA repatriation tax data, the NBER listed the key tax havens as: "Ireland, Luxembourg, Netherlands, Switzerland, Singapore, Bermuda and [the] Caribbean havens". 10 British Virgin Islands*‡Δ British Virgin Islands*‡Δ (n.a. as "Caribbean"
(*) Appears as a top ten tax haven in all three lists; 9 major tax havens meet this criterion, Ireland, Singapore, Switzerland and the Netherlands (the Conduit OFCs), and the Cayman Islands, British Virgin Islands, Luxembourg, Hong Kong and Bermuda (the Sink OFCs). (‡) Also appears as a Top 5 Sink OFC (British Virgin Islands, Luxembourg, Hong Kong, Jersey, Bermuda), in CORPNET's 2017 research. (Δ) Identified on the first, and largest, OECD 2000 list of 35 tax havens (the OECD list only contained Trinidad & Tobago by 2017). The strongest consensus amongst academics regarding the world's largest tax havens is therefore: Ireland, Singapore, Switzerland and the Netherlands (the major Conduit OFCs), and the Cayman Islands, British Virgin Islands, Luxembourg, Hong Kong and Bermuda (the major Sink OFCs), with the United Kingdom (a major Conduit OFC) still in transformation. Of these ten major havens, all except the United Kingdom and the Netherlands featured on the original Hines–Rice 1994 list. The United Kingdom was not a tax haven in 1994, and Hines estimated the Netherlands's effective tax rate in 1994 at over 20% (he estimated Ireland's at 4%). Four of them, Ireland, Singapore, Switzerland (3 of the 5 top Conduit OFCs), and Hong Kong (a top 5 Sink OFC), featured in the Hines–Rice 1994 list's 7 major tax havens sub–category; highlighting a lack of progress in curtailing tax havens. In terms of proxy indicators, this list, excluding Canada, contains all seven of the countries that received more than one US tax inversion since 1982 (see here). In addition, six of these major tax havens are in the top 15 GDP-per-capita, and of the four others, three of them, the Caribbean locations, are not included in IMF-World Bank GDP-per-capita tables. In a June 2018 joint IMF report into the effect of BEPS flows on global economic data, eight of the above (excluding Switzerland and the United Kingdom) were cited as the world's leading tax havens. (*) Appears in as a § Top 10 tax havens in all three quantitative lists, Hines 2010, ITEP 2017 and Zucman 2018 (above); all nine such § Top 10 tax havens are listed below. (♣) Appears on the James Hines 2010 list of 52 tax havens; seventeen of the twenty locations below, are on the James Hines 2010 list. (Δ) Identified on the largest OECD 2000 list of 35 tax havens (the OECD list only contained Trinidad & Tobago by 2017); only four locations below were ever on an OECD list. (↕) Identified on the European Union's first 2017 list of 17 tax havens; only one location below is on the EU 2017 list. *♣Ireland – a major corporate tax haven, and ranked by tax academics as the largest; leader in IP–based BEPS tools (e.g. double Irish), but also Debt-based BEPS tools. *♣Singapore – the major corporate tax haven for Asia (APAC headquarters for most US technology firms), and key conduit to core Asian Sink OFCs, Hong Kong and Taiwan. *♣Netherlands – a major corporate tax haven, and the largest Conduit OFC via its IP-based BEPS tools (e.g. Dutch Sandwich); traditional leader in Debt-based BEPS tools. *♣Switzerland – both a major traditional tax haven (or Sink OFC), and a major corporate tax haven (or Conduit OFC), and strongly linked to major Sink OFC, Jersey. *♣Luxembourg – one of the largest Sink OFCs in the world (a terminus for many corporate tax havens, especially Ireland and the Netherlands). *♣Hong Kong – the "Luxembourg of Asia", and almost as large a Sink OFC as Luxembourg; tied to APAC's largest corporate tax haven, Singapore. British Overseas Territories (same geographic scale) includes leading traditional and corporate tax global tax havens, including the U.K. itself. ♣Cyprus – damaged its reputation during the financial crisis when the Cypriot banking system nearly collapsed, however reappearing in top 10 lists. Taiwan – major traditional tax haven for APAC, and described by the Tax Justice Network as the "Switzerland of Asia". ♣Malta – an emerging tax haven inside the EU, which has been a target of wider media scrutiny. Debated by many to not be a tax haven due to higher headline tax rates, but has come known as "The EU's Panama". ♣ΔJersey (United Kingdom dependency), still a major traditional tax haven; the CORPNET research identifies a very strong connection with Conduit OFC Switzerland (e.g. Switzerland is increasingly relying on Jersey as a traditional tax haven); issues of financial stability. *♣ΔBritish Virgin Islands, largest Sink OFC in the world and regularly appears alongside the Caymans and Bermuda (the Caribbean "triad") as a group. *♣Bermuda, does feature as a U.S. corporate tax haven; only 2nd to Ireland as a destination for U.S. tax inversions. *♣Cayman Islands, also features as a major U.S. corporate tax haven; 6th most popular destination for U.S. corporate tax inversions. ♣ΔGibraltar – like the Isle of Man, has declined due to concerns, even by the U.K., over its practices. ♣Mauritius – has become a major tax haven for both SE Asia (especially India) and African economies, and now ranking 8th overall. Curacao – the Dutch dependency ranked 8th on the Oxfam's tax haven list, and the 12th largest Sink OFC, and recently made the EU's greylist. ♣ΔLiechtenstein – long-established very traditional European tax haven and just outside of the top 10 global Sink OFCs. ♣ΔBahamas – acts as both a traditional tax haven (ranked 12th Sink OFC), and ranks 8th on the ITEP profits list (figure 4, page 16) of corporate havens; 3rd highest secrecy score on the FSI. ♣Δ↕Samoa – a traditional tax haven (ranked 14th Sink OFC), used to have one of the highest secrecy scores on the FSI, since reduced moderately. Post–2010 research on tax havens is focused on quantitative analysis (which can be ranked), and tends to ignore very small tax havens where data is limited as the haven is used for individual tax avoidance rather than corporate tax avoidance. The last credible broad unranked list of global tax havens is the James Hines 2010 list of 52 tax havens. It is shown below but expanded to 55 to include havens identified in the July 2017 Conduit and Sink OFCs study that were not considered havens in 2010, namely the United Kingdom, Taiwan, and Curaçao. The James Hines 2010 list contains 34 of the original 35 OCED tax havens; and compared with the § Top 10 tax havens and § Top 20 tax havens above, show OECD processes focus on the compliance of tiny havens. (†) Identified as one of the 5 Conduits by CORPNET in 2017; the above list has 5 of the 5. (‡) Identified as one of the largest 24 Sinks by CORPNET in 2017; the above list has 23 of the 24 (Guyana missing). (↕) Identified on the European Union's first 2017 list of 17 tax havens; the above list contains 8 of the 17. (Δ) Identified on the first, and the largest, OECD 2000 list of 35 tax havens (the OECD list only contained Trinidad & Tobago by 2017); the above list contains 34 of the 35 (U.S. Virgin Islands missing). Delaware (United States), a unique "onshore" specialised haven with very strong secrecy laws. Puerto Rico (United States), almost a corporate tax haven "concession" by the U.S., but which the Tax Cuts and Jobs Act of 2017 mostly removes. United States – noted for secrecy, per the Financial Secrecy Index, (see United States as a tax haven); makes a "controversial" appearance on some lists. Neither the U.S. or Germany have appeared on any tax haven lists by the main academic leaders in tax haven research, namely: James R. Hines Jr., Dhammika Dharmapala or Gabriel Zucman. There are no known cases of foreign firms executing tax inversions to the U.S. or Germany for tax purposes, a basic characteristic of a corporate tax haven. Beirut, Lebanon formerly had a reputation as the only tax haven in the Middle East. However, this changed after the Intra Bank crash of 1966, and the subsequent political and military deterioration of Lebanon dissuaded foreign use of the country as a tax haven. Liberia had a prosperous ship registration industry. The series of violent and bloody civil wars in the 1990s and early 2000s severely damaged confidence in the country. The fact that the ship registration business still continues is partly a testament to its early success, and partly a testament to moving the national shipping registry to New York, United States. Tangier had a short existence as a tax haven in the period between the end of effective control by the Spanish in 1945 until it was formally reunited with Morocco in 1956. Some Pacific islands were tax havens but were curtailed by OECD demands for regulation and transparency in the late 1990s, on the threat of blacklisting. Vanuatu's Financial Services commissioner said in May 2008 that his country would reform laws and cease being a tax haven. "We've been associated with this stigma for a long time and we now aim to get away from being a tax haven." 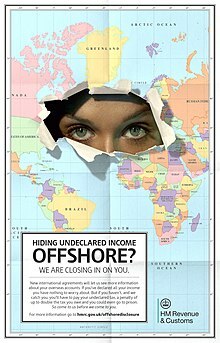 Poster issued by British HMRC to counter offshore tax evasion. Estimating the financial scale of tax havens is complicated by their inherent lack of transparency. Even jurisdictions that comply with OECD–transparency requirements such Ireland, Luxembourg, and the Netherlands, provide alternate secrecy tools (e.g. Trusts, QIAIFs and ULLs). For example, when the EU Commission discovered Apple's tax rate in Ireland was 0.005%, they found Apple's had used Irish ULLs to avoid filing Irish public accounts since the early 1990s. Additionally, there is sometimes confusion between figures that focus on the amount of annual taxes lost due to tax havens (estimated to be in the hundreds of billions of USD), and figures that focus on the amount of capital residing in tax havens (estimated to be in the trillions of USD). Banking data. Estimating the amount of capital in the private and/or offshore banking system through IMF–BIS bank filings; associated with several NGOs. National accounts data. Estimating the amount of capital that is unreconciled in global national accounts data; associated with tax academic Gabriel Zucman. Corporate data. Estimating BEPS flows of multinationals that are untaxed; associated with tax academics (Hines, Zucman), NGOs, and OECD–IMF studies. There have been many other "guesstimates" produced by NGOs which are either crude derivatives of the first method ("Banking data"), and are often criticised for taking mistaken interpretations and conclusions from aggregate global banking and financial data, to produce unsound estimates. A notable study on the financial effect was Price of Offshore: Revisited in 2012–2014, by former McKinsey & Company chief economist James S. Henry. Henry did the study for the Tax Justice Network (TJN), and as part of his analysis, chronicled the history of past financial estimates by various organisations. These figures only include "financial assets" and do not include assets such as Real Estate, precious metals etc. Henry's credibility and the depth of this analysis meant that the report attracted international attention. The TJN supplemented his report with another report on the consequences of the analysis in terms of global inequality and lost revenues to developing economies. The report was criticised by a 2013 report funded by Jersey Finance (a lobby group for the financial services sector in Jersey), and written by two U.S. academics, Richard Morriss and Andrew Gordon. In 2014, the TJN issued a report responding to these criticisms. In 2015, French tax economist Gabriel Zucman published the The Hidden Wealth of Nations which used global national accounts data to calculate the quantum of net foreign asset positions of rich countries which are unreported because there are located in tax havens. Zucman estimated that circa 8–10% of the global financial wealth of households, or over US$7.6 trillion, was held in tax havens. Zucman followed up his 2015 book with several co-authored papers that focused on corporate use of tax havens, titled The Missing Profits of Nations (2016–2018), and The Exorbitant Tax Privilege (2018), which showed that corporations, shield over US$250 billion per annum from taxes. Zucman showed that almost half of these are U.S. corporations, and that it was the driver of how U.S. corporations built up offshore cash deposits of US$1 to 2 trillion since 2004. Zucman's (et alia) analysis showed that global GDP figures were materially distorted by multinational BEPS flows. In 2007, the OECD estimated that capital held offshore amounted to between US$5 to 7 trillion, making up approximately 6–8% of total global investments under management. In 2017, as part of the OECD BEPS Project, it estimated that between US$100 to 240 billion in corporate profits where being shielded from taxation via BEPS activities carried out through tax haven type jurisdictions. 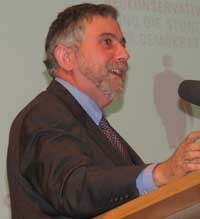 Nobel Prize-winning economist Paul Krugman called the 2015 restatement of Ireland's national accounts, as a result of the Q1 2015 restructuring of Apple's BEPS tools in Ireland, "leprechaun economics", due to the extreme levels of distortion that BEPS tools were having on Irish GDP/GNP. In February 2017, Ireland replaced GDP/GNP with "Modified GNI". Tax havens, traditional and corporate, have high GDP-per-capita rankings, because the haven's national economic statistics are artificially inflated by the BEPS accounting flows that add to the haven's GDP (and even GNP), but are not taxable in the haven. As the largest facilitators of BEPS flows, corporate-focused tax havens, in particular, make up most of the top 10-15 GDP-per-capita tables, excluding oil and gas nations (see table below). Research into tax havens suggest a high GDP-per-capita score, in the absence of material natural resources, as an important proxy indicator of a tax haven. At the core of the FSF-IMF definition of an offshore financial centre is a country where the BEPS flows are out of proportion to the size of the indigenous economy. Apple's Q1 2015 "leprechaun economics" BEPS transaction in Ireland was a dramatic example, which caused Ireland to abandon its GDP and GNP metrics in February 2017, in favour of a new metric, modified gross national income, or GNI*. This artificial inflation of GDP can attract excess foreign capital, who misprice their capital by using a Debt-to-GDP metric for the haven, thus producing phases of stronger economic growth. However, the increased leverage leads to more severe credit cycles, particularly where the artificial nature of the GDP is exposed to foreign investors. An example is the Irish financial crisis in 2009–2013. Data is sourced from List of countries by GDP (PPP) per capita and the figures, where shown (marked by, ‡), are USD per capita for places that are not tax havens. "Top 10 Tax Haven" in the table refers to the § Top 10 tax havens above; 6 of the 9 tax havens that appear in all § Top 10 tax havens are represented above (Ireland, Singapore, Switzerland, the Netherlands, Luxembourg and Hong Kong), and the remaining 3 havens (Cayman Islands, Bermuda, British Virgin Islands), do not appear in World Bank-IMF GDP-per-capita tables. In several research papers, James R. Hines Jr. showed that tax havens were typically small but well-governed nations and that being a tax haven had brought significant prosperity. In 2009, Hines and Dharmapala suggested that roughly 15% of countries are tax havens, but they wondered why more countries had not become tax havens given the observable economic prosperity it could bring. There are roughly 40 major tax havens in the world today, but the sizable apparent economic returns to becoming a tax haven raise the question of why there are not more. Hines and Dharmapala concluded that governance was a major issue for smaller countries in trying to become tax havens. Only countries with strong governance and legislation which was trusted by foreign corporates and investors, would become tax havens. Hines and Dharmapala's positive view on the financial benefits of becoming a tax haven, as well as being two of the major academic leaders into tax haven research, put them in sharp conflict with non-governmental organisations advocating tax justice, such as the Tax Justice Network, who accused them as promoting tax avoidance. A finding of the 1994 Hines-Rice paper, re-affirmed by others, was that: low foreign tax rates [from tax havens] ultimately enhance U.S. tax collections. Hines showed that as a result of paying no foreign taxes by using tax havens, U.S. multinationals avoided building up foreign tax credits that would reduce their U.S. tax liability. Hines returned to this finding several times, and in his 2010 § Important papers on tax havens, Treasure Islands, where he showed how U.S. multinationals used tax havens and BEPS tools to avoid Japanese taxes on their Japanese investments, noted that this was being confirmed by other empirical research at a company-level. Hines's observations would influence U.S. policy towards tax havens, including the 1996 "check-the-box"[g] rules, and U.S. hostility to OECD attempts in curbing Ireland's BEPS tools,[h] and why, in spite of public disclosure of tax avoidance by firms such as Google, Facebook, and Apple, with Irish BEPS tools, little has been done by the U.S. to stop them. U.S. multinationals book over half of their non-U.S. profits in tax havens by using BEPS tools (2016 BEA). Lower foreign tax rates entail smaller credits for foreign taxes and greater ultimate U.S. tax collections (Hines and Rice, 1994). Dyreng and Lindsey (2009), offer evidence that U.S. firms with foreign affiliates in certain tax havens pay lower pay lower foreign taxes and higher U.S. taxes than do otherwise-similar large U.S. companies. Research in June–September 2018, confirmed U.S. multinationals as the largest global users of tax havens and BEPS tools. U.S. multinationals use tax havens[i] more than multinationals from other countries which have kept their controlled foreign corporations regulations. No other non-haven OECD country records as high a share of foreign profits booked in tax havens as the United States. [...] This suggests that half of all the global profits shifted to tax havens are shifted by U.S. multinationals. By contrast, about 25% accrues to E.U. countries, 10% to the rest of the OECD, and 15% to developing countries (Tørsløv et al., 2018). —  Gabriel Zucman, Thomas Wright, "The Exorbitant Tax Privilege", NBER Working Papers (September 2018). Distribution of U.S. corporate profits (as a % of U.S. GDP) booked in foreign locations (BEA Data). Well over half the profits that American companies report earning abroad are still booked in only a few low-tax havens — places that, of course, are not actually home to the customers, workers, and taxpayers facilitating most of their business. A multinational corporation can route its global sales through Ireland, pay royalties to its Dutch subsidiary and then funnel income to its Bermudian subsidiary — taking advantage of Bermuda’s corporate tax rate of zero. —  Brad Setser, "The Global Con Hidden in Trump’s Tax Reform Law, Revealed", New York Times (February 2019). Academics who study tax havens, attribute Washington's support of U.S. corporate use of tax havens to a "political compromise" between Washington, and other higher-tax OECD nations, to compensate for shortcomings of the U.S. "worldwide" tax system. Hines had advocated for a switch to a "territorial" tax system, as most other nations use, which would remove U.S. multinational need for tax havens. In 2016, Hines, with German tax academics, showed that German multinationals make little use of tax havens because their tax regime, a "territorial" system, removes any need for it. Hines' research was cited by the Council of Economic Advisors ("CEA") in drafting the TCJA legislation in 2017, and advocating for moving to a hybrid "territorial" tax system framework. Joel Slemrod testifying to the President's Advisory Panel for Federal Tax Reform (2005). Slemrod rejected Hines, Desai, and Dharmapala's observations, that tax havens might support global economic growth, instead calling tax havens parasitic. The effect of tax havens on economic welfare in high tax countries is unclear, though the availability of tax havens appears to stimulate economic activity in nearby high-tax countries. Tax havens change the nature of tax competition among other countries, very possibly permitting them to sustain high domestic tax rates that are effectively mitigated for mobile international investors whose transactions are routed through tax havens. [..] In fact, countries that lie close to tax havens have exhibited more rapid real income growth than have those further away, possibly in part as a result of financial flows and their market effects. The most cited paper on research into offshore financial centres ("OFCs"), a closely related term to tax havens, noted the positive and negative aspects of OFCs on neighbouring high-tax, or source, economies, and marginally came out in favour of OFCs. CONCLUSION: Using both bilateral and multilateral samples, we find empirically that successful offshore financial centers encourage bad behavior in source countries since they facilitate tax evasion and money laundering [...] Nevertheless, offshore financial centers created to facilitate undesirable activities can still have unintended positive consequences. [...] We tentatively conclude that OFCs are better characterized as "symbionts". However, other notable tax academics strongly dispute these views, such as work by Slemrod and Wilson, who in their § Important papers on tax havens, label tax havens as parasitic to jurisdictions with normal tax regimes, that can damage their economies. In addition, tax justice campaign groups have been equally critical of Hines, and others, in these views. Research in June 2018 by the IMF showed that much of the foreign direct investment ("FDI") that came from tax havens into higher-tax countries, had really originated from the higher-tax country, and for example, that the largest source of FDI into the United Kingdom, was actually from the United Kingdom, but invested via tax havens. The boundaries with wider contested economic theories on the effects of corporate taxation on economic growth, and whether there should be corporate taxes, are easy to blur. Other major academic leaders in tax haven research, such as Zucman, highlight the injustice of tax havens and see the effects as lost income for the development of society. It remains a controversial area with advocates on both sides. Corporations can establish subsidiary corporations and/or regional headquarters in corporate tax havens for tax planning purposes. Where a corporate moves their legal headquarters to a haven, it is known as a corporate tax inversion. The rise of intellectual property, or IP, as a major BEPS tax tool, has meant that corporates can achieve much of the benefits of a tax inversion, without needing to move their headquarters. Apple's $300 billion quasi-inversion to Ireland in 2015 (see leprechaun economics) is a good example of this. Much of the economic activity in tax havens today consists of professional financial services such as mutual funds, banking, life insurance and pensions. Generally, the funds are deposited with the intermediary in the low-tax country, and the intermediary then on-lends or invests the money in another location. Although such systems do not normally avoid tax in the principal customer's country, it enables financial service providers to provide international products without adding another layer of taxation. This has proved particularly successful in the area of offshore funds. It has been estimated over 75% of the world's hedge funds, probably the riskiest form of collective investment vehicle, are domiciled in the Cayman Islands, with nearly $1.1 trillion US Assets under management although statistics in the hedge fund industry are notoriously speculative. Bearer shares allow for anonymous ownership, and thus have been criticized for facilitating money laundering and tax evasion; these shares are also available in some OECD countries as well as in the U.S. state of Wyoming. :7 In a 2010 study in which the researcher attempted to set-up anonymous corporations found that 13 of the 17 attempts were successful in OECD countries, such as the United States and the United Kingdom, while only 4 of 28 attempts were successful in countries typically labeled tax havens. The last two states in America permitting bearer shares, Nevada and Delaware made them illegal in 2007. In 2011, an OECD peer review recommended that the United Kingdom improve its bearer share laws. The UK abolished the use of bearer shares in 2015. In 2012 the Guardian wrote that there are 28 persons as directors for 21,500 companies. Most tax havens have a double monetary control system, which distinguish residents from non-resident as well as foreign currency from the domestic, the local currency one. In general, residents are subject to monetary controls, but not non-residents. A company, belonging to a non-resident, when trading overseas is seen as non-resident in terms of exchange control. It is possible for a foreigner to create a company in a tax haven to trade internationally; the company's operations will not be subject to exchange controls as long as it uses foreign currency to trade outside the tax haven. Tax havens usually have currency easily convertible or linked to an easily convertible currency. Most are convertible to US dollars, euro or to pounds sterling. The Foreign Account Tax Compliance Act (FATCA) was passed by the US Congress to stop the outflow of money from the country into tax haven bank accounts. With the strong backing of the Obama Administration, Congress drafted the FATCA legislation and added it into the Hiring Incentives to Restore Employment Act (HIRE) signed into law by President Obama in March 2010. FATCA requires foreign financial institutions (FFI) of broad scope – banks, stock brokers, hedge funds, pension funds, insurance companies, trusts – to report directly to the Internal Revenue Service (IRS) all clients who are U.S. persons. Starting January 2014, FATCA requires FFIs to provide annual reports to the IRS on the name and address of each U.S. client, as well as the largest account balance in the year and total debits and credits of any account owned by a U.S. person. If an institution does not comply, the U.S. will impose a 30% withholding tax on all its transactions concerning U.S. securities, including the proceeds of sale of securities. In addition, FATCA requires any foreign company not listed on a stock exchange or any foreign partnership which has 10% U.S. ownership to report to the IRS the names and tax identification number (TIN) of any U.S. owner. FATCA also requires U.S. citizens and green card holders who have foreign financial assets in excess of $50,000 to complete a new Form 8938 to be filed with the 1040 tax return, starting with fiscal year 2010. The delay is indicative of a controversy over the feasibility of implementing the legislation as evidenced in this paper from the Peterson Institute for International Economics. An unintended consequence of FATCA and its cost of compliance for non-US banks is that some non-US banks are refusing to serve American investors. Concerns have also been expressed that, because FATCA operates by imposing withholding taxes on U.S. investments, this will drive foreign financial institutions (particularly hedge funds) away from investing in the U.S. and thereby reduce liquidity and capital inflows into the US. A 2012 report by the Tax Justice Network estimated that between US$21 trillion and $32 trillion is sheltered from taxes in tax havens worldwide. If such wealth earns 3% annually and such capital gains were taxed at 30%, it would generate between $190 billion and $280 billion in tax revenues, more than any other tax shelter. If such hidden offshore assets are considered, many countries with governments nominally in debt are shown to be net creditor nations. However, despite being widely quoted, the methodology used in the calculations has been questioned, and the tax policy director of the Chartered Institute of Taxation also expressed skepticism over the accuracy of the figures. Another recent study estimated the amount of global offshore wealth at the smaller—but still sizable—figure of US$7.6 trillion. This estimate included financial assets only: "My method probably delivers a lower bound, in part because it only captures financial wealth and disregards real assets. After all, high-net-worth individuals can stash works of art, jewelry, and gold in 'freeports,' warehouses that serve as repositories for valuables—Geneva, Luxembourg, and Singapore all have them. High-net-worth individuals also own real estate in foreign countries." A study of 60 large US companies found that they deposited $166 billion in offshore accounts during 2012, sheltering over 40% of their profits from U.S. taxes. Details of thousands of owners of offshore companies were published in April 2013 in a joint collaboration between The Guardian and the International Consortium of Investigative Journalists. The data was later published on a publicly accessible website in an attempt to "crowd-source" the data. The publication of the list appeared to be timed to coincide with the 2013 G8 summit chaired by British Prime Minister David Cameron which emphasised tax evasion and transparency. Germany announced in February 2008 that it had paid €4.2 million to Heinrich Kieber [de], a former data archivist of LGT Treuhand, a Liechtenstein bank, for a list of 1,250 customers of the bank and their accounts' details. Investigations and arrests followed relating to charges of illegal tax evasion. The German authorities shared the data with U.S. tax authorities, but the British government paid a further £100,000 for the same data. Other governments, notably Denmark and Sweden, refused to pay for the information regarding it as stolen property. The Liechtenstein authorities subsequently accused the German authorities of espionage. However, regardless of whether unlawful tax evasion was being engaged in, the incident has fuelled the perception among European governments and the press that tax havens provide facilities shrouded in secrecy designed to facilitate unlawful tax evasion, rather than legitimate tax planning and legal tax mitigation schemes. This in turn has led to a call for "crackdowns" on tax havens. Whether the calls for such a crackdown are mere posturing or lead to more definitive activity by mainstream economies to restrict access to tax havens is yet to be seen. No definitive announcements or proposals have yet been made by the European Union or governments of the member states. Peer Steinbrück, the former German finance minister, announced in January 2009 a plan to amend fiscal laws. New regulations would disallow that payments to companies in certain countries that shield money from disclosure rules to be declared as operational expenses. The effect of this would make banking in such states unattractive and expensive. 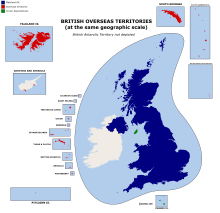 In November 2009, Sir Michael Foot, a former Bank of England official and Bahamas bank inspector, delivered a report on the British Crown Dependencies and Overseas Territories for HM Treasury. The report indicated that while many of the territories "had a good story to tell", others needed to improve their abilities to detect and prevent financial crime. The report also stressed the view that narrow tax bases presented long term strategic risks and that the economies should seek to diversify and broaden their tax bases. It indicated that tax revenue lost by the UK government appeared to be much smaller than had previously been estimated (see above under Lost tax revenue), and also stressed the importance of the liquidity provided by the territories to the United Kingdom. The Crown Dependencies and Overseas Territories broadly welcomed the report. The pressure group Tax Justice Network, unhappy with the findings, commented that "[a] weak man, born to be an apologist, has delivered a weak report." Those that have substantially implemented the standard (includes most countries but China still excludes Hong Kong and Macau). Financial centres that have committed to – but not yet fully implemented – the standard (includes Guatemala, Costa Rica and Uruguay). Those countries in the bottom tier were initially classified as being 'non-cooperative tax havens'. Uruguay was initially classified as being uncooperative. However, upon appeal the OECD stated that it did meet tax transparency rules and thus moved it up. The Philippines took steps to remove itself from the blacklist and Malaysian Prime Minister Najib Razak had suggested earlier that Malaysia should not be in the bottom tier. In April 2009 the OECD announced through its chief Angel Gurria that Costa Rica, Malaysia, the Philippines and Uruguay have been removed from the blacklist after they had made "a full commitment to exchange information to the OECD standards." Despite calls from the former French President Nicolas Sarkozy for Hong Kong and Macau to be included on the list separately from China, they are as yet not included independently, although it is expected that they will be added at a later date. Government response to the crackdown has been broadly supportive, although not universal. Luxembourg Prime Minister Jean-Claude Juncker has criticised the list, stating that it has "no credibility", for failing to include various states of the USA which provide incorporation infrastructure which are indistinguishable from the aspects of pure tax havens to which the G20 object. As of 2012, 89 countries have implemented reforms sufficient to be listed on the OECD's white list. According to Transparency International half of the least corrupted countries were tax havens. In December 2017, European Union adopted blacklist of tax havens in a bid to discourage the most aggressive tax dodging practices. It also had a so-called gray list which includes those who have committed to change their rules on tax transparency and cooperation. The 17 blacklisted territories are: American Samoa, Bahrain, Barbados, Grenada, Guam, South Korea, Macau, The Marshall Islands, Mongolia, Namibia, Palau, Panama, Saint Lucia, Samoa, Trinidad and Tobago, Tunisia, United Arab Emirates. Some activists denounced the listing process as a whitewash and had called for the inclusion in the blacklist of some EU countries accused of facilitating tax avoidance, like Luxembourg, Malta, Ireland and the Netherlands. The Common Reporting Standard is an information standard for the automatic exchange of tax and financial information on a global level developed by the Organisation for Economic Co-operation and Development in 2014. Participating in the CRS from 1 January 2017 onwards are Australia, the Bahamas, Bahrain, Brazil, Brunei Darussalam, Canada, Chile, China, The Cook Islands, Hong Kong, Indonesia, Israel, Japan, Kuwait, Lebanon, Macau, Malaysia, Mauritius, Monaco, New Zealand, Panama, Qatar, Russia, Saudi Arabia, Singapore, Switzerland, Turkey, the United Arab Emirates, Uruguay. The use of differing tax laws between two or more countries to try to mitigate tax liability is probably as old as taxation itself. In Ancient Greece, some of the Greek Islands were used as depositories by the sea traders of the era to place their foreign goods to thus avoid the two-percent tax imposed by the city-state of Athens on imported goods. The practice may have first reached prominence through the avoidance of the Cinque Ports and later the staple ports in the twelfth and fourteenth centuries respectively. In 1721, American colonies traded from Latin America to avoid British taxes. Most economic commentators suggest that the first "true" tax haven was Switzerland, followed closely by Liechtenstein. [page needed] Swiss banks had long been a capital haven for people fleeing social upheaval in Russia, Germany, South America and elsewhere. However, in the early part of the twentieth century, during the years immediately following World War I, many European governments raised taxes sharply to help pay for reconstruction efforts following the devastation of World War I. By and large, Switzerland, having remained neutral during the Great War, avoided these additional infrastructure costs and was consequently able to maintain a low level of taxes. As a result, there was a considerable influx of capital into the country for tax related reasons. It is difficult, nonetheless, to pinpoint a single event or precise date which clearly identifies the emergence of the modern tax haven. The use of modern tax havens has gone through several phases of development subsequent to the interwar period. From the 1920s to the 1950s, tax havens were usually referenced as the avoidance of personal taxation. The terminology was often used with reference to countries to which a person could retire and mitigate their post retirement tax position, a usage which was still being echoed to some degree in a 1990 report, which included indications of quality of life in various tax havens which future tax exiles may wish to consider. From the 1950s onward, there was significant growth in the use of tax havens by corporate groups to mitigate their global tax burden. The strategy generally relied upon there being a double taxation treaty between a large country with a high tax burden (that the company would otherwise be subject to), and a smaller country with a low tax burden. By structuring the group ownership through the smaller country, corporations could take advantage of the double taxation treaty, paying taxes at the much lower rate. Although some of these double tax treaties survive,[when? ], for example between Barbados and Japan, between Cyprus and Russia and Mauritius with India, which India sought to renegotiate in 2007, most major countries began repealing their double taxation treaties with micro-states in the 1970s, to prevent corporate tax leakage in this manner. In the early to mid-1980s, most tax havens changed the focus of their legislation to create corporate vehicles which were "ring-fenced" and exempt from local taxation (although they usually could not trade locally either). These vehicles were usually called "exempt companies" or "international business corporations". However, in the late 1990s and early 2000s, the OECD began a series of initiatives aimed at tax havens to curb the abuse of what the OECD referred to as "unfair tax competition". Under pressure from the OECD, most major tax havens repealed their laws permitting these ring-fenced vehicles to be incorporated, but concurrently they amended their tax laws so that a company which did not actually trade within the country would not accrue any local tax liability. The following are the most cited papers on "tax havens", as ranked on the IDEAS/RePEc database of economic papers, at the Federal Reserve Bank of St. Louis. Papers marked (‡) were cited by the EU Commission 2017 summary as the most important research on tax havens. Papers on tax havens, ranked by academic citations, over the last 25 years. ^ Since the post–2000 OECD–IMF–FATF initiatives on reducing banking secrecy and increasing transparency, modern academics consider the secrecy component to be redundant. See § Definitions. ^ a b c The FSI is often misquoted as a ranking of "tax havens", however the FSI does not quantify tax avoidance or BEPS flows like modern quantitative tax haven lists; the FSI it is a qualitative scoring of secrecy indicators, and does not score some of the most common secrecy tools - the unlimited liability company, the trust, and various special purpose vehicles (e.g. Irish QIAIFs and L–QIAIFs) - few of which are required to file public accounts in major tax havens, such as Ireland and the United Kingdom. ^ The list of sovereign states numbered 206 as at September 2018, so 15% equates to just over 30 tax havens; the OECD's 2000 list had 35 tax havens, the James Hines 2010 list had 52 tax havens, the 2017 Conduit and Sink OFCs study lists 29 states. ^ a b The ITEP list only focuses on Fortune 500 Companies; its strong correlation with tax haven lists derived from global studies highlights that U.S multinationals are the most dominant source of global tax avoidance, and users of tax havens. ^ The U.S. refused to sign the OECD BEPS Multilateral Instrument ("MLI") on the 24 November 2016. ^ a b "Financial Times Lexicon: Definition of tax haven". Financial Times. June 2018. A country with little or no taxation that offers foreign individuals or corporations residency so that they can avoid tax at home. ^ a b "Tax haven definition and meaning | Collins English Dictionary". Collins Dictionary. Retrieved 27 December 2017. A tax haven is a country or place which has a low rate of tax so that people choose to live there or register companies there in order to avoid paying higher tax in their own countries. ^ a b c d e f g h Dhammika Dharmapala; James R. Hines Jr. (2009). "Which countries become tax havens?" (PDF). Journal of Public Economics. 93 (9–10): 1058–1068. doi:10.1016/j.jpubeco.2009.07.005. The “tax havens” are locations with very low tax rates and other tax attributes designed to appeal to foreign investors. ^ a b James R. Hines Jr.; Anna Gumpert; Monika Schnitzer (2016). "Multinational Firms and Tax Havens". The Review of Economics and Statistics. 98 (4): 713–727. Tax havens are typically small, well-governed states that impose low or zero tax rates on foreign investors. ^ Shaxson, Nicholas (9 January 2011). "Explainer: what is a tax haven?". The Guardian. The Guardian. Retrieved 27 December 2017. ^ a b c d Laurens Booijink; Francis Weyzig (July 2007). "Identifying Tax Havens and Offshore Finance Centres" (PDF). Tax Justice Network and Centre for Research on Multinational Corporations. Various attempts have been made to identify and list tax havens and offshore finance centres (OFCs). This Briefing Paper aims to compare these lists and clarify the criteria used in preparing them. ^ a b "Netherlands and UK are biggest channels for corporate tax avoidance". The Guardian. 25 July 2017. ^ a b "Is the U.K. Already the Kind of Tax Haven It Claims It Won't Be?". Bloomberg News. 31 July 2017. ^ "Tax Havens Can Be Surprisingly Close to Home". Bloomberg View. 11 April 2017. ^ a b c "The Missing Profits of Nations" (PDF). Gabriel Zucman (University of Berkley). April 2018. p. 68. ^ a b c "BEPS Project Background Brief" (PDF). OECD. January 2017. p. 9. With a conservatively estimated annual revenue loss of USD 100 to 240 billion, the stakes are high for governments around the world. The impact of BEPS on developing countries, as a percentage of tax revenues, is estimated to be even higher than in developed countries. ^ a b c d Gabriel Zucman (August 2014). "Taxing across Borders: Tracking Personal Wealth and Corporate Profits". Journal of Economic Perspectives. 28 (4): 121–48. doi:10.1257/jep.28.4.121. ^ a b Gabriel Zucman (8 November 2017). "The desperate inequality behind global tax dodging". The Guardian. Retrieved 6 March 2019. The equivalent of 10% of global GDP is held offshore by rich individuals in the form of bank deposits, equities, bonds and mutual fund shares, most of the time in the name of faceless shell corporations, foundations and trusts. ^ a b c James R. Hines Jr. (2007). "Tax Havens" (PDF). The New Palgrave Dictionary of Economics. Tax havens are low-tax jurisdictions that offer businesses and individuals opportunities for tax avoidance. They attract disproportionate shares of world foreign direct investment, and, largely as a consequence, their economies have grown much more rapidly than the world as a whole over the past 25 years. ^ a b c James R. Hines Jr. (2005). "Do Tax Havens Flourish" (PDF). National Bureau of Economic Research, Tax Policy and the Economy. 19: 65–99. ABSTRACT: Per capita real GDP in tax haven countries grew at an average annual rate of 3.3 percent between 1982 and 1999, which compares favorably to the world average of 1.4 percent. ^ a b Oliver Bullough (8 December 2015). "The fall of Jersey: how a tax haven goes bust". The Guardian. Jersey bet its future on finance but since 2007 it has fallen on hard times and is heading for bankruptcy. Is the island's perilous present Britain's bleak future? ^ a b c Scott Dyreng; Bradley P. Lindsey (12 October 2009). "Using Financial Accounting Data to Examine the Effect of Foreign Operations Located in Tax Havens and Other Countries on US Multinational Firms' Tax Rates". Journal of Accounting Research. 47 (5): 1283–1316. doi:10.1111/j.1475-679X.2009.00346.x. Finally, we find that US firms with operations in some tax haven countries have higher federal tax rates on foreign income than other firms. This result suggests that in some cases, tax haven operations may increase US tax collections at the expense of foreign country tax collections. ^ a b c James K. Jackson (11 March 2010). "The OECD Initiative on Tax Havens" (PDF). Congressional Research Service. p. 7. As a result of the Bush Administration’s efforts, the OECD backed away from its efforts to target “harmful tax practices” and shifted the scope of its efforts to improving exchanges of tax information between member countries. ^ Alex Cobham (11 September 2017). "New UN tax handbook: Lower-income countries vs OECD BEPS failure". Tax Justice Network. ^ a b "Tax Havens". Tax Justice Network. 2018. There is no generally agreed definition of what a tax haven is. ^ a b c d e f g Dhammika Dharmapala (December 2008). "What Problems and Opportunities are Created by Tax Havens?". Oxford Review of Economic Policy. 24 (4): 3. Although tax havens have attracted widespread interest (and a considerable amount of opprobrium) in recent years, there is no standard definition of what this term means. Typically, the term is applied to countries and territories that offer favorable tax regimes for foreign investors. ^ "Tax haven blacklisting in Latin America". Tax Justice Network. 6 April 2017. ^ a b c d e f James R. Hines Jr.; Eric Rice (February 1994). "FISCAL PARADISE: FOREIGN TAX HAVENS AND AMERICAN BUSINESS" (PDF). Quarterly Journal of Economics (Harvard/MIT). 9 (1). We identify 41 countries and regions as tax havens for the purposes of U. S. businesses. Together the seven tax havens with populations greater than one million (Hong Kong, Ireland, Liberia, Lebanon, Panama, Singapore, and Switzerland) account for 80 percent of total tax haven population and 89 percent of tax haven GDP. ^ a b Sébastien Laffitte; Farid Toubal (July 2018). "Firms, Trade and Profit Shifting: Evidence from Aggregate Data" (PDF). CESifo Economic Studies: 8. Concerning the characterization of tax havens, we follow the definition proposed by Hines and Rice (1994) which has been recently used by Dharmapala and Hines (2009). ^ "COUNTERING OFFSHORE TAX EVASION" (PDF). OECD. September 2009. p. 3. ^ "Tax Haven Criteria". Oecd.org. 26 February 2008. Archived from the original on 12 May 2012. Retrieved 22 March 2011. ^ "Harmful Tax Competition: An Emerging Global Issue" (PDF). OECD. 9 April 1998. ^ Francis Weyzig (2013). "Tax treaty shopping: structural determinants of FDI routed through the Netherlands" (PDF). International Tax and Public Finance. 20 (6): 910–937. doi:10.1007/s10797-012-9250-z. The four OECD member countries Luxembourg, Ireland, Belgium and Switzerland, which can also be regarded as tax havens for multinationals because of their special tax regimes. ^ "Activists and experts ridicule OECD's tax havens 'blacklist' as a farce". Humanosphere. 30 June 2017. One of the criteria, for example, is that a country must be at least “largely compliant” with the Exchange Of Information on Request standard, a bilateral country-to-country information exchange. According to Turner, this standard is outdated and has been proven to not really work. ^ "Oxfam disputes opaque OECD failing just one tax haven on transparency". Oxfam. 30 June 2017. ^ "What Makes a Country a Tax Haven? An Assessment of International Standards Shows Why Ireland Is Not a Tax Haven" (PDF). Department of Finance (Ireland)/Economic and Social Research Institute Review. September 2013. p. 403. Ireland does not meet any of the OECD criteria for being a tax haven but because of its 12.5 per cent corporation tax rate and the open nature of the Irish economy, Ireland has on a few occasions been labelled a tax haven. ^ "Offshore Financial Centers: IMF Background Paper". International Monetary Fund. 23 June 2000. ^ Ronen Palan (4 April 2012). "Tax Havens and Offshore Financial Centres" (PDF). University of Birmingham. Some experts see no difference between tax havens and OFCs and employ the terms interchangeably. ^ Ronen Palan; Richard Murphy (2010). Tax Havens and Offshore Financial Centres. Cornell Studies in Money. Cornell University Press. p. 24. ISBN 9780801476129. Yet today it is difficult to distinguish between the activities of tax havens and OFCs. ^ a b Dhammika Dharmapala (2014). "What Do We Know About Base Erosion and Profit Shifting? A Review of the Empirical Literature". University of Chicago. p. 1. It focuses particularly on the dominant approach within the economics literature on income shifting, which dates back to Hines and Rice (1994) and which we refer to as the “Hines-Rice” approach. ^ Javier Garcia-Bernardo; Jan Fichtner; Frank W. Takes; Eelke M. Heemskerk (24 July 2017). "Uncovering Offshore Financial Centers: Conduits and Sinks in the Global Corporate Ownership Network". Scientific Reports. 7 (6246). ^ Gabriel Zucman (April 2018). "The Missing Profits of Nations" (PDF). National Bureau of Economic Research, Working Papers. p. 35. ^ a b Jesse Drucker (27 January 2016). "The World's Favorite New Tax Haven Is the United States". Bloomberg.com. ^ Wood, Robert W. (27 January 2016). "The World's Next Top Tax Haven Is...America". Forbes. Retrieved 7 June 2016. ^ Swanson, Ana (5 April 2016). "How the U.S. became one of the world's biggest tax havens". Washington Post. Retrieved 23 April 2016. ^ "Outbreak of 'so whatery' over EU tax haven blacklist". Irish Times. 7 December 2017. It was certainly an improvement on the list recently published by the Organisation for Economic Co-operation and Development, which featured only one name – Trinidad & Tobago – but campaigners believe the European Union has much more to do if it is to prove it is serious about addressing tax havens. ^ a b "Tax Battles: the dangerous global race to the bottom on corporate tax". Oxfam. December 2016. ^ "TAX BATTLES The dangerous global Race to the Bottom on Corporate Tax" (PDF). Oxfam. December 2016. ^ a b "Zucman:Corporations Push Profits Into Corporate Tax Havens as Countries Struggle in Pursuit, Gabrial Zucman Study Says". Wall Street Journal. 10 June 2018. The new research draws on data from countries such as Ireland, Luxembourg and the Netherlands that hadn’t previously been collected. ^ a b c d e f g h "Tracking Tax Runaways". Bloomberg News. 1 March 2017. ^ "Tech giants eating up Dublin's office market". Irish Times. 18 April 2018. ^ "Google's new APAC headquarters in Singapore is a blend of office building and tech campus". CNBC. November 2016. ^ "Facebook's Singapore APAC Headquarters". The Independent. October 2015. ^ a b c d e f Gabriel Zucman; Thomas Wright (September 2018). "The Exorbitant Tax Privilege" (PDF). National Bureau of Economic Research: 11. ^ a b c Damgaard, Jannick; Elkjaer, Thomas; Johannesen, Niels (June 2018). "Piercing the Veil of Tax Havens". International Monetary Fund: Finance & Development Quarterly. 55 (2). The eight major pass-through economies—the Netherlands, Luxembourg, Hong Kong SAR, the British Virgin Islands, Bermuda, the Cayman Islands, Ireland, and Singapore—host more than 85 percent of the world’s investment in special purpose entities, which are often set up for tax reasons. ^ "Ireland: Where Profits Pile Up, Helping Multinationals Keep Taxes Low". Bloomberg News. October 2013. ^ "Multinationals channel more money through "hubs" in Singapore, Switzerland than ever before, Tax Office says". Sydney Morning Herald. 5 February 2015. ^ "Bermuda? Guess again. Turns out Holland is the tax haven of choice for US companies". The Correspondent. 30 June 2017. ^ Markle, Kevin S.; Shackelford, Douglas A. (June 2009). "Do Multinationals or Domestic Firms Face higher Effective Tax Rates?". National Bureau of Economic Research. doi:10.3386/w15091. ^ "Taiwan, the un-noticed Asian tax haven?". Tax Justice Network. 10 February 2016. ^ "Scientists have found a way of showing how Malta is a global top ten tax haven". Malta Today. 31 July 2017. ^ Borg, Jacob (29 July 2017). "'Malta is main EU tax haven' - study". Times Malta. ^ "Malta is a target for Italian mafia, Russia loan sharks, damning probe says". Times of Malta. 20 May 2017. ^ Guides, Malta (22 February 2019). "Is Malta a Tax Haven?". Malta Guides. Retrieved 7 April 2019. ^ Grech, Herman (25 May 2017). "Is Malta really Europe's 'pirate base' for tax?". Retrieved 7 April 2019. ^ "The Isle of Man is failing at being a tax haven". Tax Research UK. 2 August 2017. ^ "Top tax haven got more investment in 2013 than India and Brazil: U.N". Reuters. 28 January 2014. Retrieved 29 July 2015. ^ Guardian US interactive team (21 January 2014). "China's princelings storing riches in Caribbean offshore haven". the Guardian. Retrieved 29 July 2015. ^ William Brittain-Catlin (2005): Offshore – The Dark Side of the Global Economy; Farrar, Straus and Giroux, 2005. ^ "Defend Gibraltar? Better condemn it as a dodgy tax haven". The Guardian. 9 April 2017. ^ "Deloitte promotes Mauritius as tax haven to avoid big payouts to poor African nations". The Guardian. 3 November 2013. ^ "Rise of tax haven Mauritius comes at the expense of rest of Africa". Irish Times. 7 November 2017. ^ "EU RELEASES TAX HAVEN BLACKLIST; NETHERLANDS NOT ON IT". NL.com. 6 December 2017. ^ "Liechtenstein: The mysterious tax heaven that's losing the trust of the super-rich". The Independent U.K. 8 March 2018. ^ "SAMOA: Ranked No.1 as world's most secretive tax haven, potential for more investors". Pacific Guardians. 15 February 2015. ^ Leslie Wayne (2012): How Delaware Thrives as a Corporate Tax Haven; The New York Times, 30 Jun. 2012. ^ Reuven S. Avi-Yonah (2012): Statement to Congress; University of Michigan School of Law, Permanent Subcommittee on Investigations, U.S. Congress, 20 Sep. 2012. ^ "Puerto Rico Governor: GOP tax bill is 'serious setback' for the island". CNN. 20 September 2017. ^ Fischer, Konrad (25 October 2016). "A German Tax Haven". Handelsblatt Global. ^ "Lebanon: Election Under Fire". Time Magazine. 17 May 1976. ^ Klan, Anthony (6 May 2008). "Vanuatu to ditch tax haven". The Australian. Archived from the original on 7 May 2008. ^ Bremner, Brian (15 November 2017). "The Final Days of a Tax Haven". Bloomberg. ^ a b c d e James S. Henry (1 July 2012). "The Pre-History of Offshore Estimates" (PDF). Tax Justice Network. Retrieved 4 March 2019. ^ a b c Gordon, Richard; Morriss, Andrew (20 October 2013). "Moving Money: International Financial Flows, Taxes & Money Laundering". Hastings International and Comparative Law Review. 31 (1): 123. SSRN 2348144. (From abstract) In this paper we argue that such claims rest on poor data and analysis, and on mistakes about how financial transactions, international taxation, and anti-money laundering rules actually work. ^ a b Heather Stewart (21 July 2010). "£13tn hoard hidden from taxman by global elite". The Guardian. James Henry, former chief economist at consultancy McKinsey and an expert on tax havens, has compiled the most detailed estimates yet of the size of the offshore economy in a new report, The Price of Offshore Revisited, released exclusively to the Observer. ^ a b James S. Henry (July 2014). "The Price of Offshore Revisited" (PDF). Tax Justice Network. Retrieved 4 March 2019. ^ a b c Nicholas Shaxson (22 July 2012). "Revealed: Global super-rich has at least $21 trillion hidden in secret tax havens" (PDF). Tax Justice Network. Retrieved 4 March 2019. ^ Chris Vellacott (22 July 2012). "Super rich hold $32 trillion in offshore havens". Reuters. Retrieved 22 July 2012. The study estimating the extent of global private financial wealth held in offshore accounts - excluding non-financial assets such as real estate, gold, yachts and racehorses - puts the sum at between $21 and $32 trillion. ^ "Tax havens: Super-rich 'hiding' at least $21tn". BBC News. 22 July 2012. Retrieved 5 March 2019. Mr Henry said his $21tn is actually a conservative figure and the true scale could be $32tn. A trillion is 1,000 billion. Mr Henry used data from the Bank of International Settlements, International Monetary Fund, World Bank, and national governments. ^ Nicholas Shaxson; John Christensen; Nick Mathiason (22 July 2012). "Inequality: You don't know the half of it" (PDF). Tax Justice Network. Retrieved 4 March 2019. ^ Nicholas Shaxson (4 June 2014). "Tax haven of Jersey to attack TJN with funded study. We respond". Tax Justice Network. Retrieved 4 March 2019. ^ Nicholas Shaxson (4 June 2014). "Jersey Finance attacks TJN 2014 - TJN response" (PDF). Tax Justice Network. Retrieved 4 March 2019. ^ a b "New research finds 40% of multinationals' profits shifted to tax havens – EU biggest loser while US firms most shifty". Business Insider. 20 July 2018. ^ a b "Half of US foreign profits booked in tax havens: paper". phys.org. 10 September 2019. Retrieved 2 March 2019. US companies are by far the biggest users of tax havens, where they face effective tax rates of just seven percent, according to the study by economists Thomas Wright and Gabriel Zucman. ^ "Places in the sun". The Economist. 22 February 2007. Retrieved 4 March 2019. ^ "How tax havens turn economic statistics into nonsense". Quartz. 11 June 2018. ^ IMF working paper: Concept of Offshore Financial Centers: In Search of an Operational Definition; Ahmed Zoromé; IMF Working Paper 07/87; April 1, 2007. (PDF) . Retrieved on 2011-11-02. ^ "Why Tax Havens are Political and Economic disasters". The Atlantic. 28 July 2016. ^ a b PPP (current international $)", World Development Indicators database, World Bank. Database updated on 1 July 2017. Accessed on 2 July 2017. ^ "Jim Hines fails to defend secrecy jurisdictions". Tax Justice Network. 3 March 2010. ^ a b Nicholas Shaxson (19 November 2010). "Tax havens' arguments in their defence – and why they are wrong". First, many these claims rest heavily on work done by James Hines of the University of Michigan and a few others – research that is fatally flawed. ^ a b c d Qing Hong; Michael Smart (January 2010). "In praise of tax havens: International tax planning and foreign direct investment" (PDF). European Economic Review. 54 (1): 82–95. doi:10.1016/j.euroecorev.2009.06.006. ^ a b Brad Setser, Council on Foreign Relations (6 February 2019). "The Global Con Hidden in Trump's Tax Reform Law, Revealed". New York Times. Retrieved 24 February 2019. ^ Jane G. Gravelle (1 August 2017). "Reform of U.S. International Taxation: Alternatives" (PDF). Congressional Research Service. ^ Ronen Palan; Richard Murphy; Christian Chavagneux (1 July 2011). Tax havens: How Globalization Really Works. Cornell University Press. ISBN 978-0801476129. ^ James R. Hines Jr.; Anna Gumpert; Monika Schnitzer (2016). "Multinational Firms and Tax Havens". The Review of Economics and Statistics. 98 (4): 714. Germany taxes only 5% of the active foreign business profits of its resident corporations. [..] Furthermore, German firms do not have incentives to structure their foreign operations in ways that avoid repatriating income. Therefore, the tax incentives for German firms to establish tax haven affiliates are likely to differ from those of U.S. firms and bear strong similarities to those of other G-7 and OECD firms. ^ "Corporate Tax Reform and Wages: Theory and Evidence" (PDF). Council of Economic Advisors. 17 October 2017. Applying Hines and Rice’s (1994) findings to a statutory corporate rate reduction of 15 percentage points (from 35 to 20 percent) suggests that reduced profit shifting would result in more than $140 billion of repatriated profit based on 2016 numbers. ^ "White House Push to Help Workers Through Corporate Tax Cut Draws Skepticism". New York Times. 17 October 2017. But the CEA did not misinterpret the Desai, Foley, and Hines paper. ^ a b Andrew K. Rose; Mark M. Spiegel (21 September 2007). "Offshore Financial Centers: Parasites or Symbionts?" (PDF). 117 (523). The Economic Journal: 1310–1335. ^ Max de Haldevang (11 June 2018). "How tax havens turn economic statistics into nonsense". Quartz (publication). For example, according to the UK Treasury, on the surface it looks like Britain’s second-biggest investor is the Netherlands. But the UK Treasury has admitted most of those investments actually consist of British cash that has been sent to Holland for tax purposes and rerouted back home. So, Britain’s second biggest foreign investor is itself. ^ Gabriel Zucman (8 November 2017). "The desperate inequality behind global tax dodging". The Guardian. ^ "Fighting tax dodgers can kill economic growth". Bloomberg. 25 July 2018. ^ Reuven S. Avi-Yonah (2002): For Haven's Sake: Reflections on Inversion Transactions; University of Michigan Law School, Tax Notes, Vol. 95 no. 12, 17 June 2002. ^ This is a simplistic example; in most sophisticated tax codes there are extensive provisions for catching "gifts" (such as a declaration of trust) made for a specified time preceding death. ^ Gravelle JG. (2013). Tax Havens: International Tax Avoidance and Evasion. CRS. ^ Sharman JC. (2010). Shopping for Anonymous Shell Companies: An Audit Study of Anonymity and Crime in the International Financial System Archived 10 July 2012 at the Wayback Machine. Journal of Economic Perspectives. ^ Bearer shares and delays blot UK record on information exchange. Tax Journal. ^ Leigh, David; Frayman, Harold; Ball, James (25 November 2012). "Offshore secrets revealed: the shadowy side of a booming industry". The Guardian. Guardian News and Media Limited. Retrieved 12 June 2015. ^ U.S. Internal Revenue Service (14 July 2011). "Treasury and IRS Issue Guidance Outlining Phased Implementation of FATCA Beginning in 2013". Retrieved 25 August 2011. ^ "For most individual taxpayers, this means they will start filing Form 8938 with their 2011 income tax return to be filed this coming tax filing season." U.S. Internal Revenue Service (25 January 2012). "Do I need to file Form 8938, "Statement of Specified Foreign Financial Assets"?". Retrieved 3 July 2012. ^ "Gary Clyde Hufbauer: The Foreign Account Tax Compliance Act: Imperial Overreach". 22 July 2011. Retrieved 25 August 2011. ^ Spiegel Online (14 December 2011). "European banks stop serving American customers". Retrieved 31 December 2011. ^ "Another approach would involve some global funds avoiding American assets entirely. That can hardly be what Congress had in mind." The Economist (26 November 2011). "Scratched by the FATCA". Retrieved 16 July 2012. ^ "Tax havens: Super-rich 'hiding' at least $21tn". BBC News. ^ Canadian Broadcasting Co. (22 July 2012) "Wealthy hiding $21 trillion in tax havens, report says"
^ John Whiting, tax policy director at the Chartered Institute of Taxation commented "There clearly are some significant amounts hidden away, but if it really is that size what is being done with it all?" and "If the suggestion is that such amounts are actively hidden and never accessed, that seems odd—not least in terms of what the tax authorities are doing. In fact, the US, UK and German authorities are doing a lot", and noting that if the figures were accurate "you would expect the havens to be more conspicuously wealthy than they are". However, he also admitted that "I cannot disprove the figures at all, but they do seem staggering" "Tax havens: Super-rich 'hiding' at least $21tn". 22 July 2012. Retrieved 3 October 2012. ^ Scott Thurm; Kate Linebaugh (10 March 2013). 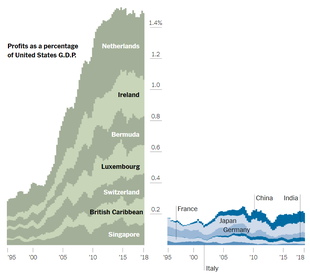 "More U.S. Profits Parked Abroad, Saving on Taxes". Wall Street Journals. Retrieved 19 March 2013. ^ Yahoo! News (5 April 2013). "Tax haven data leak names names, raises questions". ^ The Guardian (15 June 2013). "Offshore Leaks app puts secret users of tax havens in the public eye". ^ Mr Kieber seems to be an unlikely hero for law enforcement authorities. A convicted fraudster, reports indicate that after initially stealing the information, he blackmailed the Liechtenstein authorities into reducing and dropping criminal charges against him relating to property fraud in Spain. However, before returning the disks he made copies which he later sold to foreign governments after he left the country. Further reports indicate that he now lives under a new name in Australia. ^ Staff, SPIEGEL (25 February 2008). "Liechtenstein's Shadowy Informant: Tax Whistleblower Sold Data to the US" – via Spiegel Online. ^ Nick Mathiason. "A journey from haven to hell". the Guardian. Retrieved 29 July 2015. ^ Denmark's tax minister, Kristian Jensen, said: "I think it's a moral problem to reward a criminal for some information that he stole... I don't like this and I don't think this ethic is the best way to ensure that taxes are paid correctly." ^ Harry de Quetteville 12:01AM GMT 20 Feb 2008 (20 February 2008). "''The Daily Telegraph'', 26 February 2008". London: Telegraph.co.uk. Retrieved 22 March 2011. ^ "Germany to call for tax haven crackdown". Accountancyage.com. Archived from the original on 4 July 2008. Retrieved 29 July 2015. ^ Der Spiegel (17 January 2009). "Steinbrück forciert Kampf gegen Steuerparadiese" (in German). Retrieved 17 January 2009. ^ "Michael Foot publishes final report". HM Treasury. 29 October 2009. Archived from the original on 18 November 2009. Retrieved 5 November 2009. ^ a b "Governor and Premier Welcome Michael Foot Review Conclusions". 30 October 2009. Retrieved 27 January 2014. ^ "The Foot Report: a setback". Tax Justice Network. 29 October 2009. Retrieved 5 November 2009. ^ a b Watt, Nicholas; Elliott, Larry; Borger, Julian; Black, Ian (2 April 2009). "G20 declares door shut on tax havens". The Guardian. ^ "A Progress Report on The Jurisdictions Surveyed by The OECD Global Forum in Implementing The Internationally Agreed Tax Standard" (PDF). OECD. 2 April 2009. ^ "OECD names and shames tax havens". BBC News. 3 April 2009. Retrieved 4 April 2009. ^ BBC (7 April 2009). "OECD removes tax havens from list". BBC News. Retrieved 7 April 2009. ^ Butler, Eamonn (12 April 2009). "Save the tax havens – we need them". London: The Times. Retrieved 14 April 2009. ^ Clark, Andrew (10 April 2009). "Welcome to tax-dodge city, USA". London: The Guardian. Retrieved 14 April 2009. ^ "Tax haven clampdown yields cash but secrecy still thrives." Reuters, 26 July 2012. ^ Guarascio, Francesco. "EU tax haven blacklist set to shrink further, causing outcry". Retrieved 17 April 2018. ^ Robertson, Jamie (5 December 2017). "First tax havens blacklist published by EU". Bbc.com. Retrieved 17 April 2018. ^ "Common Reporting Standard (CRS) – Organisation for Economic Co-operation and Development". Oecd.org. Retrieved 17 April 2018. ^ Tax Havens and Their Uses, The Economist,1990, Special Report No. 1191, ISBN 0 85058 292 X. ^ For example, the British Virgin Islands repealed the International Business Companies Act (Cap 291) (which had prohibited such companies from trading locally) and enacted the BVI Business Companies Act 2004 (which permitted this) in its place. Contemporaneously it varied its tax laws by amending the Income Tax Act (Cap 206), which amended the rate of income tax for individuals and corporations to zero, along with the Payroll Taxes Act 2004 which imposed a (new) payroll tax on person employed by businesses within the British Virgin Islands. Raymond W. Baker (2005). Capitalism's Achilles' Heel: Dirty Money, and How to Renew the Free-Market System. John Wiley & Sons. ISBN 978-0471644880. Ronen Palan; Richard Murphy; Christian Chavagneux (2009). Tax Havens: How Globalization Really Works. Cornell University Press. ISBN 978-0-8014-7612-9. Nicholas Shaxson (2011). Treasure Islands: Uncovering the Damage of Offshore Banking and Tax Havens. Palgrave Macmillan. ISBN 978-0-230-10501-0. Gabriel Zucman (2016). The Hidden Wealth of Nations: The Scourge of Tax Havens. University of Chicago Press. ISBN 978-0226422640. Foremny, D., & Von Hagen, J. (2012). "Fiscal federalism in times of crisis", CEPR Discussion Papers 9154, C.E.P.R. Discussion Papers. Henry, James S. (October 2003). The Blood Bankers: Tales from the Global Underground Economy. New York, NY: Four Walls Eight Windows. ISBN 978-1-56858-254-2. Morriss, Andrew P. (2010). Offshore Financial Centers and Regulatory Competition. Washington: The AEI Press. ISBN 978-0-8447-4324-0. Scevola, Carlo; Sneiderova, Karina (January 2010). Offshore Jurisdictions Guide. Geneva, Switzerland: CS&P Fiduciaire. ISBN 978-1-60594-433-3. Look up tax haven in Wiktionary, the free dictionary. An OECD Proposal To Eliminate Tax Competition Would Mean Higher Taxes and Less Privacy – Heritage Foundation: Washington D.C. The Tax Justice Network, is an independent international network, launched in 2003, focused on research, analysis and advocacy in the area of international tax and financial regulation, including the role of tax havens. TJN maps, analyses and explains the impacts of tax evasion, tax avoidance and tax competition; and supports the engagement of citizens, civil society organisations and policymakers with the aim of a more just tax system. The Double Irish is a base erosion and profit shifting ("BEPS") corporate tax tool, used mostly by US multinationals since the late 1980s, to avoid corporate taxation on most non–U.S. profits. It is the largest tax avoidance tool in history and by 2010, was shielding US$100 billion annually in US multinational foreign profits from taxation, and was the main tool by which US multinationals built up untaxed offshore reserves of US$1 trillion from 2004 to 2018. Traditionally, it was also used with the Dutch Sandwich BEPS tool; however, changes to Irish tax law in 2010 dispensed with this requirement for most users. James R. Hines Jr. is an American economist and a founder of academic research into corporate-focused tax havens, and the effect of U.S. corporate tax policy on the behaviors of U.S. multinationals. His papers were some of the first to analyse profit shifting, and to establish quantitative features of tax havens. Hines showed that being a tax haven could be a prosperous strategy for a jurisdiction, and controversially, that tax havens can promote economic growth. Hines showed that use of tax havens by U.S. multinationals had maximized long-term U.S. exchequer tax receipts, at the expense of other jurisdictions. Hines is the most cited author on the research of tax havens, and his work on tax havens was relied upon by the CEA when drafting the Tax Cuts and Jobs Act of 2017.